We accept Bank Wire Transfers (Domestic: $15, International: $28), Cashiers Check, Money Order, Company Check (14 day hold), and Personal Check (21 day hold). This vacuum system has an Edwards RV3 pump and a vacuum chamber. It was used as an evaperation system in a labratory. 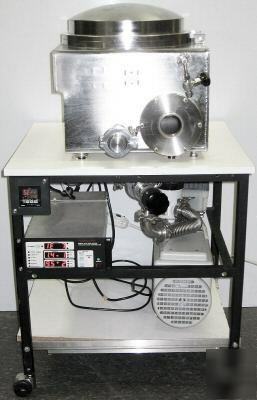 * Chamber Dimensions: Approximately 13.5" x 15.5" 9"
NOTES: This system is in very good condition and produces a very good vacuum inside the chamber. Please see the pictures. If you have any questions about this, please let me know.